This tutorial will guide users through the process of developing and deploying a JavaServer Faces 2.2.4 application on the 1.9.6 version of Google's App Engine for Java using the 2.2.4 version of Oracle's reference implementation of the specification. The application built out in the course of writing this tutorial is available from http://jsf22template.wildstartech.com/. The source code is available from the jsf22template Google Code project. One of the key features of the JavaServer Faces 2.2 specification is the ability to use annotations to define managed beans rather than using the faces-config.xml. While the annotations provided by JSF 2.2 are fantastic, you may consider taking advantage of the capabilities offered by the Contexts and Dependency Injection (JSR-299) (CDI) framework (the JSR was referred to as "Web Beans" prior to January 26, 2009). CDI provides similarly named @ApplicationScoped, @SessionScoped, @RequestScoped annotations (part of the javax.enterprise.context package) but uses a @Named annotation in favor of the JSF 2.0 @ManagedBean annotation. CDI also introduces the @ConversationScoped annotation which is familiar to Seam aficionados and provides a variable-length scope that can span requests but isn't as long-lived as either the Session or Application scope. If you are interested in incorporating the CDI framework into your App Engine project, have a look a the "Configuring JBoss Weld to Run with JavaServer Faces on the Google App Engine" after completing this tutorial (currently in a draft state). In order to build a JavaServer Faces 2.2 application and have it run on the Google App Engine platform, you will need to have the following software downloaded and installed locally. 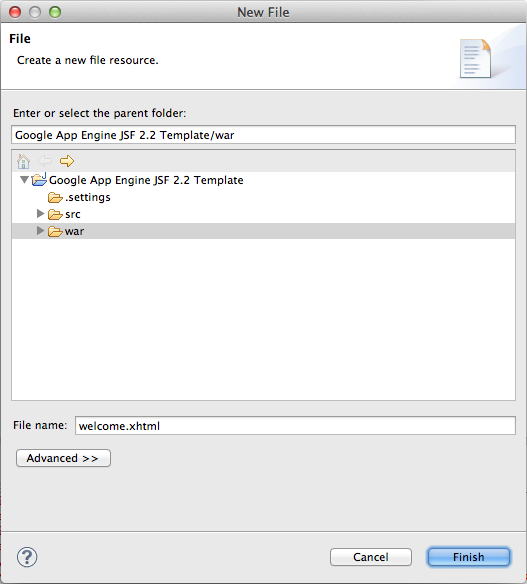 You can download the Google AppEngine SDK v1.9.6 and install it locally on your system; however, this tutorial is written from the perspective of using the Google Plugin for Eclipse. Download and install the Kepler release of the Eclipse SDK. Follow the instructions on the "Downloading and Installing the Plugin". Download the Oracle JavaServer Faces 2.2.4 (implementation [javax.faces-2.2.4.jar] and source [javax.faces-2.2.4-sources.jar]) jar files. Download and uncompress version 2.3.1 (jboss-seam-2.3.1.Final.zip) of the Seam 2 framework. 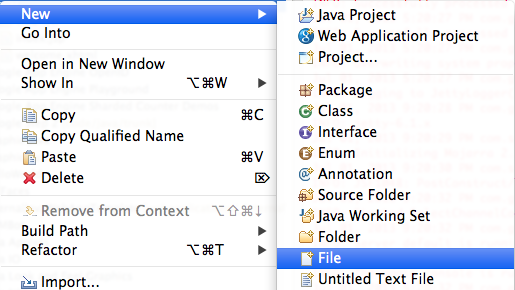 From the 'New' sub-menu on the 'File' menu, select the "Web Application Project" menu option. Give your project a name in the 'Project Name' field. For the purposes of this tutorial, we will use "Google App Engine JSF 2.2 Template". Enter your project's default package name in the 'Package' field. For the purposes of this tutorial, we will use "com.wildstartech.gae.jsf22template". Remove the check mark from the 'Use Google Web Toolkit' box in the "Google SDKs" portion of the dialog. Ensure the "Use Google App Engine" option has a check mark beside it. Remove the check mark beside the "Generate project sample code" option. The following steps will guide you through the process of importing the files which provide support for the new Unified Expression Language. Prior to completing this step, you should have downloaded version 2.3.1 of the Seam 2 framework. Once you uncompress the jboss-seam-2.3.1.Final.zip archive, the el-api.jar , jboss-el-api_2.2_spec.jar, and jboss-el.jar files are located in the lib folder. Left-click on the 'Browse...' button and select the lib folder on your local hard disk drive contained in the directory where you uncompressed the jboss-seam-2.3.1.Final.zip archive. 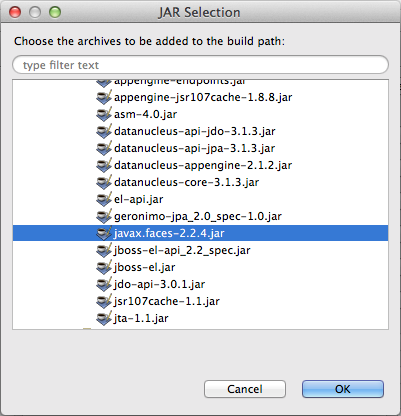 Place check marks in the boxes to the left of the el-api.jar, jboss-el-api_2.2_spec.jar, and jboss-el.jar files. NOTE: Passing arguments to expression language methods works regardless of whether the jboss-el-api_2.2_spec.jar file is present. For the time being, I'm going err on the side of caution and include it in this tutorial. The following steps will guide you through the process of importing the files that provide support for the reference implementation of the JavaServer Faces 2.2 specification. Left-click on the 'Browse...' button and select the folder on your local hard disk drive into which you saved the javax.faces-2.2.4.jar archive. Place a check mark beside the javax.faces-2.2.4.jar file and left-click not he 'Finish' button. Edit the appengine-web.xml file found in the WEB-INF directory of the project to allow the web application to store data in the session created for clients visiting our site. Add the <sessions-enabled>true</sessions-enabled> line as shown below. Add the <threadsafe>true</threadsafe> setting to instruct the App Engine runtime environment to allow a single Instance to service multiple requests concurrently. NOTE: We have set the enabled HTTP sessions in this web application by setting the <sessions-enabled> property to true. Experiments configuring App Engine to transfer session data from memcache to the datastore asynchronously to reduce request latency using the <async-session-persistence> parameter to true cause Task queue quotas to become exhausted. For the time being it is recommended the <async-session-persistence> property be set to false. For more information, please refer to the Enabling Sessions section of the Java Application Configuration document. Do not forget to modify the contents of the <application></application> tag to reflect the name of your App Engine project. Save the changes to the appengine-web.xml file and close it. Left double-click on the contents of the web.xml file found in the WEB-INF directory and replace the contents with what is shown below. The com.sun.faces.enableThreading context parameter is set in the event you use the "Development" value for the javax.faces.PROJECT_STAGE context parameter. As indicated in the comments, setting com.sun.faces.enableThreading equal to false instructs the Mojarra implementation of the JSF 2.2 API to NOT attempt to use threads as this is not allowed by the Google App Engine platform (as described in the "Sandbox" section of the "Java Servlet Environment" article on the Google App Engine documentation site). If your web project does not already contain an index.html file in the war directory, then skip to the "Creating index.jsp" sub-section. If there is already an index.html, continue with the "Renaming index.html to index.jsp and Modifying Its Contents" section which follows. A Google App Engine web project will create an index.html file as the default for your web application. In the section above, we specified a change to the <welcome-file-list> configuration parameter which instructs the App Engine's runtime environment to look for the following default pages in the specified order. 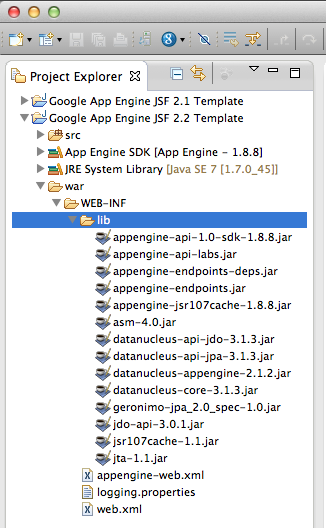 As such, we will rename the App Engine's default index.html to index.jsp. We will ensure that the browser's "back" button will continue to function properly by following the guidelines prescribed in the "Avoid Redirects" section of Yahoo! 's "Best Practices for Speeding Up Your Web Site" document. The index.jsp file will be configured to send a redirect to the browser rather than leverage an <meta http-equiv="Refresh" content="0,welcome.jsf"/> tag in the <head> of an HTML document. Locate and right-click on the index.html file in the war directory shown in the "Project Explorer" window. When the context-sensitive menu is displayed, left-click on the 'Rename...' menu item found on the 'Refactor' sub-menu. When presented with the "Rename Resource" dialog, ensure the 'New name:' field indicates the index.html should be renamed to index.jsp. Left-click on the 'OK' button to complete the file rename operation. NOTE: If you decide to use a page other than welcome.xhtml as your initial landing page, please make the appropriate change to the index.jsp shown above. Save your changes to the index.jsp and close the file. In the "Package Explorer" window, right-click on the war directory. Left-click on the "New" menu and then left-click on the "File" menu item. When presented with the "New File" dialog, type in welcome.xhtml in the 'File name:' field and then left-click on the 'Finish' button. The newly created welcome.xhtml file will be presented in the editor. Use the following as the contents of the file. NOTE: The first three lines of the file above instruct web browsers to interpret this document as a well-formed XHTML document. As described in the "The !DOCTYPE 'Switch'" section of the MSDN article entitled "CSS Enhancements in Internet Explorer 6", this text instructs versions of Internet Explorer 6 and greater to switch on standards compliance mode. Please skip to the "Add JavaServer Faces Library to Java Build Path" section. The default welcome page for our web application will be a JSP page entitled index.jsp and we will ensure that the browser's "back" button will continue to function properly by following the guidelines prescribed in the "Avoid Redirects" section of Yahoo! 's "Best Practices for Speeding Up Your Web Site" document. The index.jsp file will be configured to send a redirect to the browser rather than leverage an <meta http-equiv="Refresh" content="0,welcome.jsf"/> tag in the <head> of an HTML document. Locate and right-click on the war directory shown in the "Project Explorer" window. Left-click on the "New" menu and then left-click on the "File" menu item. When presented with the "New File" dialog, enter "index.jsp" as the value for the 'File name:" field and left-click on the "Finish" button. The newly created index.jsp file will be presented in the editor. Use the following as the contents of the file. Return to the "Project Explorer" window and right-click on the war directory. When presented with the "New File" dialog, enter "welcome.xhtml" as the value for the "File name:" field and left-click on the "Finish" button. We are going to need to add the JavaServer Faces API to the Java Build Path of our project so we do not encounter any compilation errors. 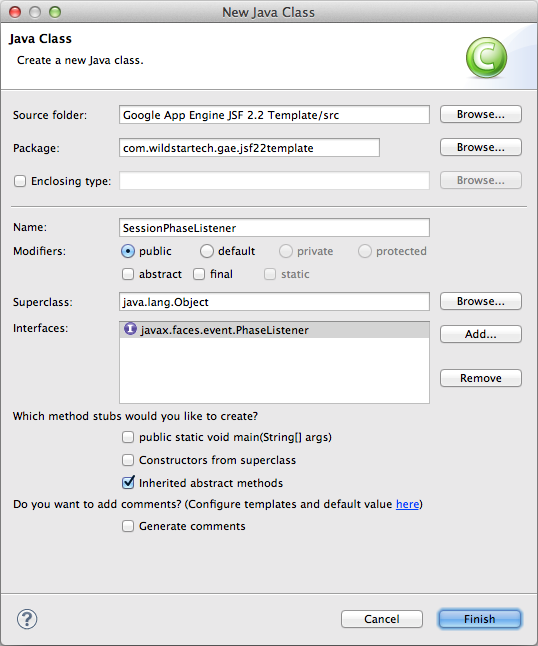 Right-click on the name of the project, "Google App Engine JSF 2.2 Template", in the "Package Explorer" window. When the context-sensitive menu is displayed, left-click on the 'Properties' menu item. When you are presented with the "Properties for Google App Engine JSF 2.2 Template" dialog, left-click on the "Java Build Path" settings and then left-click on the 'Add JARs...' button. Navigate to the war/WEB-INF/lib folder of the project, left-click on the javax-faces-2.2.4.jar file, then left-click on the 'OK' button. 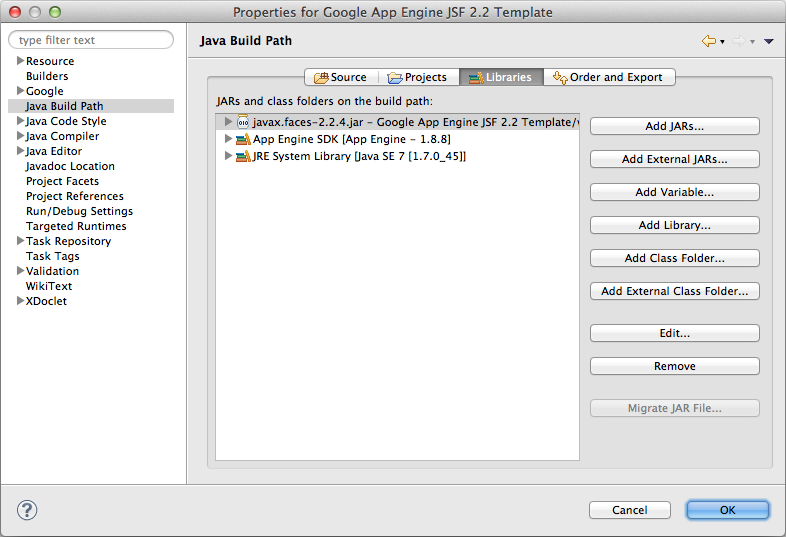 When you are returned to the "Properties for Google App Engine JSF 2.2 Template" dialog, left-click on the 'OK' button. Any time the Google App Engine framework detects a change in the HTTP session, that information is written out to the datastore. This works very well for immutable objects; however, it becomes more challenging when dealing with mutable objects as the GAE framework has no way of knowing when a field inside an object stored in the HTTP session is changed. A Stack Overflow question entitled "Session lost in Google App Engine using JSF" outlines a great strategy using a JSF PhaseListener to store the current date/time in the HTTP session at the end of each Phase. The following process will guide you through the steps necessary to create this PhaseListener. Enter "SessionPhaseListener" in the "Name" field. Left-click on the "Add..." button that appears to the right of the "Interfaces" section. When the "Implemented Interfaces Selection" dialog appears, enter "PhaseListener" in the "Choose Interfaces" field. 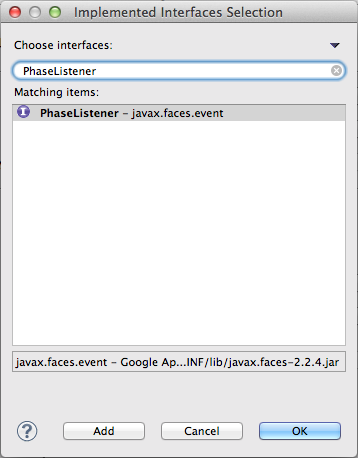 The "Matching items:" field should contain "PhaseListener - javax.faces.event" as depicted in the screen shot below. Left-click on the "OK" button. When you are returned to the "New Java Class" dialog, shown in the figure below, left-click on the "Finish" button to create the class. The source code for the SessionPhaseListener.java file will be presented and you can replace it with the code shown below. * PhaseListener to ensure the HttpSession data is written to the datastore. Obtain a reference to the FacesContext. Using the FacesContext, obtain a reference to the ExternalContext. The ExternalContext will be used to get access to the HttpSession in the form as a Map. The current date/time (expressed as milliseconds) is stored in the HttpSession. Unfortunately, the JSF 2.2 API does not provide an annotation to declare a PhaseListener programmatically, so we are going to have to create a faces-config.xml configuration file. In the "Project Explorer" tab, located on the left side of your IDE, expand your project. Expand the "war" branch of your project. Right-click on the "WEB-INF" folder, left-click on the "New" menu and then left-click on the "File" menu item. Enter "faces-config.xml" as the value for the "File name:" field as depicted in the screen shot below. Use the following as the contents for the "faces-config.xml" file and then close the editor view. Now that you have completed the requisite configuration steps, you are ready to launch your first JSF application running on the App Engine platform. 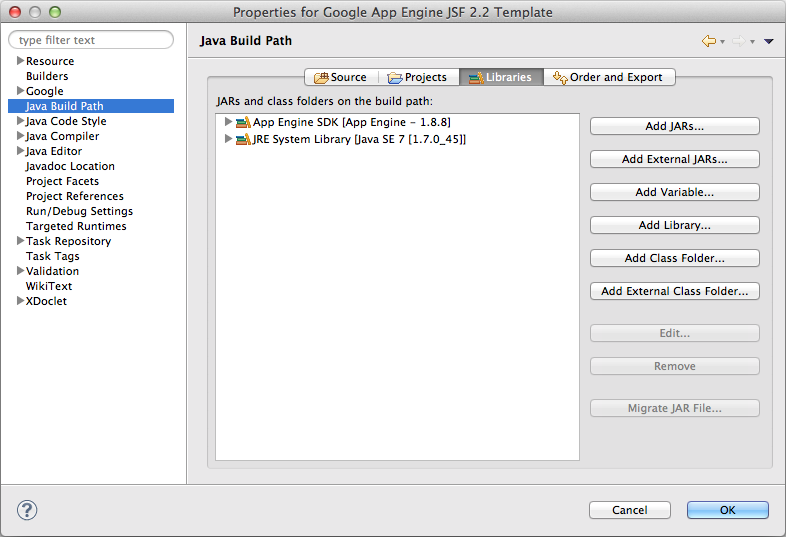 Right-click on the "Google App Engine JSF 2.2 Template" item in the "Project Explorer" window. Left-click on the "Run As" menu and then left-click on the "Web Application" menu item. Open a web browser and enter "http://localhost:8888/" in the browser's address field. Your browser will be re-directed to the "http://localhost:8888/welcome.jsf" and you should see something similar to the browser window depicted below. The following articles provide additional information on JavaServer Faces technology.